Bolton Wanderers have until 13:00 GMT on Wednesday to assure the local council that they have adequate safety provision for Saturday's Championship game against Millwall. 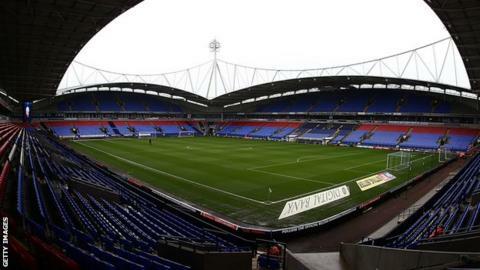 Bolton Council, the club, local police and ambulance services met on Tuesday amid concerns Wanderers may not provide sufficient stewarding for the match. Greater Manchester Police are also owed money by the club for policing matches. "We are hopeful a resolution will be found," a council statement said. "The club has recently been unable to demonstrate it can meet the legal conditions of the ground's safety certificate. "After consultation with all members of the Safety Advisory Group, the council has taken the decision to give the club 24 hours to address all safety concerns, otherwise we will reluctantly issue a prohibition notice. "We understand some fans may be alarmed by this news, but the council is bound by legal process and we are not prepared to risk public safety by allowing any event to go ahead without proper resources in place." Bolton, who are 23rd in the Championship, said in a statement that they have "provided written assurances that they are able to meet the legal conditions". Players as well as full and part-time staff, including matchday stewards, have still not been paid their salaries for February. On Monday, part-time staff issued a statement saying they had not been given any information or apology by the club as to when their wages would be paid. In addition, Bolton's training ground was closed on Monday as the club's financial problems continue to mount, having already been issued a winding-up petition by HM Revenues & Customs last month.